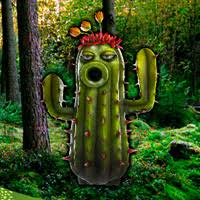 Games2Rule - G2R Carnivorous Plants Forest Escape is another point and click escape game developed by Games 2 Rule. In this game, you came to see the beauty of a forest full of carnivorous plants. But unfortunately, you missed the way out from the forest. You need to escape from the forest by finding useful objects, hints and solving puzzles. Click on the objects to interact with them and solve puzzles. Good luck and have fun! When making a 1 (tomatoes) use the right side. Sneaky axe in scene with pink 5. Now were to use this feather??? AHHH Tickle the little fox!! Ok Out not a bad game Thanks. Enjoyed this one. A bit of back and forth, but not too bad. Stuck with used knife and axe, a yellow flower, three pink plants and a coconut? That is an otter not a fox! Oops, pink plants go in scene with green 4, missed that..
Alpha is just trying to recruit people to comment here in the comment section. I agree the more people here, the more hints we have. Nothing wrong with trying to promote for more people, in my opinion. I've been posting here for almost 10 years and have never had any problems at all - it's very safe.